We have dates though August 2019!! We look forward to these professionally facilitated evenings of connection, personal growth, and mutual support. Women’s Connection is for women 18 and older. The entire group is done on the ground. No experience with horses is necessary. Whenever possible, we gather in the enclosed arena at Dandelion Farm (home of Discovery Horse). During the winter months, we meet in a cozy indoor space. Please note: It is our goal to find funding so that we never have to turn people away. Until that happens we want to work with people to the best of our ability. We can not be helpful if we do not know you need help. IF financial limitations would keep you from coming to this group and you would like to discuss this with us, please don’t hesitate to contact us at office@discoveryhorse.com. We believe that healing and personal growth happen best with a multi-faceted approach, and we believe strongly in the power of group support. Therefore, we are happy to offer a coupon code to provide a $20 discount ($45 instead of $65) for adult women who are current clients of Discovery Horse and to the spouses, mothers and adult daughters of current Discovery Horse clients (see restrictions below). If you are a current client and you did not receive an email containing this code, please email office@discoveryhorse.com and let us know. Click the “Redeem Coupon” button to enter your code. This coupon only applies to current adult female clients or the IMMEDIATE ADULT FEMALE FAMILY MEMBERS of current clients. For the purposes of this coupon adult means 18+ years. Immediate family members include spouses and all step-, adopted or foster mothers and daughters. This coupon only applies to Women’s Connection registrations. It can be used on any Women’s Connection date that is currently available. Our cancellation/refund policies still apply to discounted prices. View cancellation/refund policies below. We do ask that you discontinue use of this coupon code if you or your family member is no longer a current client. We will be checking registrations against the client list regularly. If you do use the code outside of the stated restrictions, the discount will not be honored, and will be removed from your reservation, with the difference in price being charged to your provided payment method. If for some reason you are unable to apply the code while you are registering, please contact Chelsea, and she will attempt to bully the software into getting you your discount. If fewer than 4 people are registered 24 hrs before a group, we may choose to cancel and offer a full refund. What is Women’s Connection Group? Whether you’re looking for more clarity and healing or attempting to redefine your purpose in life … this group is for you. Afraid of horses? Join us to learn a new way to define that relationship and discover how deeply it can empower you! And bring your fun pants … because we believe that laughter is indeed some of the best medicine! This group offers a fun and experiential way to deepen your self-awareness and strengthen your connection to fellow woman. Join us! Based in Gestalt methodology, this group brings together people interested in self discovery and personal growth. Group members support each other as they actively participate in their own personal work within an Emotionally Safe Communityⓒ. With the combined healing power of horses and positive coaching, results are often quick and sustainable. In coaching we believe that each person has their own answers, holds their own keys to success and happiness … we just help you reach within to find them! The entire group is done on the ground. No experience with horses is necessary. Are you interested in hosting a Women’s Connection Group at your facility with your horses? Perhaps a private group for you and your friends? 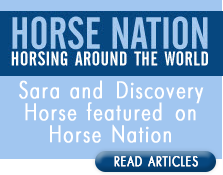 Sara loves to travel about to work with new horses and meet amazing woman! Please contact us to see how easy it is to make this a reality!